I feel it is important that you all know something about me: I drive a minivan. Really, it's true. This time last year, it was all Tokyo trains and taxis and bicycles and walking. Now it's a minivan. Don't get me wrong, I'm happy to have a vehicle to drive since public transportation is not really a thing 'round these parts. But a minivan? Yep. Please tell me I didn't just lock all the doors. Yep. The driver's side was also locked. I could see my keys perfectly on the other side of the glass, sitting next to my laptop and purse on the passenger seat. It's official. I'm locked out. Or my keys are locked in. Or whatever. I called Brad and he, by some miracle, was able to make the 45 minute drive from Denver to Boulder to let me in so we didn't have to spend a bazillion dollars on a locksmith. Hallelujah! But wait...there's more. As I sat waiting for Brad to unlock the minivan, a guy walked up to the front of my car and stands there for a moment. What is that guy doing standing in front of my minivan, you might ask? Um, he's giving me a parking ticket because my receipt is expired. I explained that my keys are locked in the car along with my purse and if I had my wallet I would happily buy another 2 hours of parking time. I'm not sure that he cared. I'll be checking the mail obsessively for a parking ticket over the next few weeks. Needless to say, the rest of my day did not go as planned. By the time Brad got to Boulder, it was time for me to head to another meeting, so I was able to blog for exactly zero minutes when I had anticipated almost 2 hours of free work time. I'm going to go ahead and say that if I had this cocktail with me while I stood outside under a strangely cloudy Colorado sky, shivering and trying to look on the bright side of this situation, my wait would have been much more pleasant. I could have imagined that it was summer and I was spending all this time outdoors for a good reason. Not because I did something super flaky. Did you have a rough week? Or perhaps you just want to welcome Friday evening with something sparkly and vaguely reminiscent of summer. Maybe Spring is making itself sparse even though it claims to have begun already? Regardless of where you find yourself this weekend, this fast, easy cocktail is sure to please. 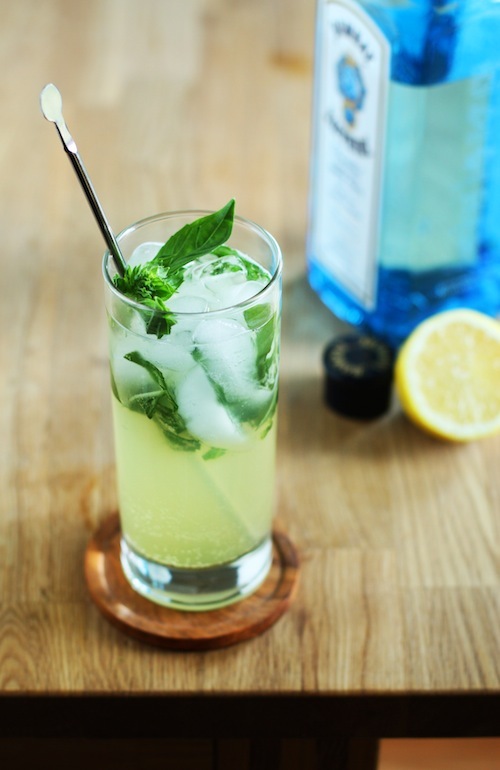 The bright basil with the piney gin and sparkling soda water is a match made in heaven. Just a little step up from the traditional gin fizz and perfectly appropriate for this time of year. You can use almost any herb for this- mint, thyme, rosemary...I wouldn't even rule out cilantro. A Gin Fizz is like a blank pallet of sorts, so if you're looking to experiment with your own cocktail inventions, this is a great place to start. So cheers to minivans, husbands who save the day, and the weekend. 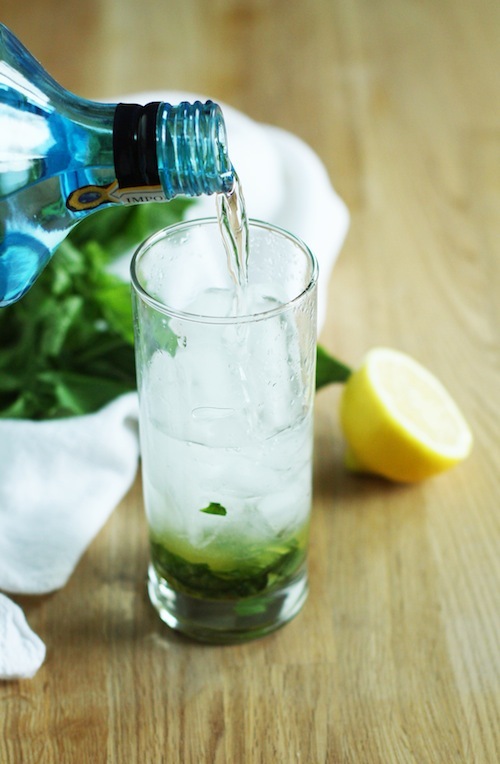 In the bottom of a Collins glass, muddle the basil with the honey and lemon juice. Fill the glass to the top with ice, then add the gin. Stir with a stir stick to fully incorporate the honey into the gin. Top with the club soda. 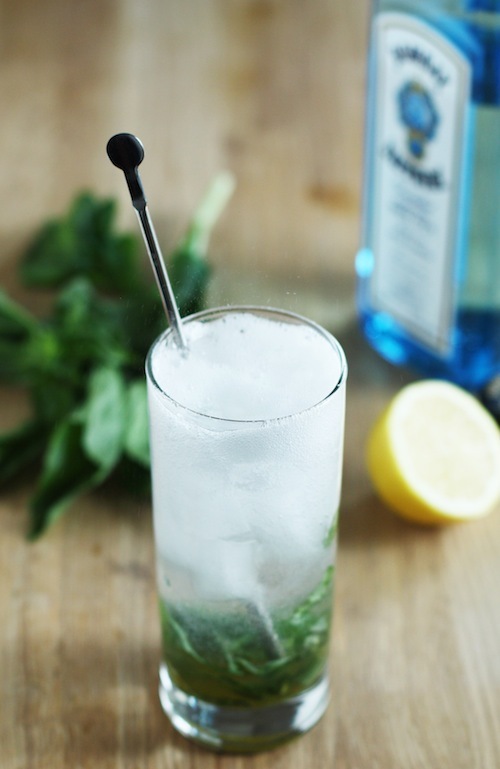 Serve with a stir stick and garnish with basil leaves and/or lemon wedge.